I like things pretty simple. Plain, even. I have a hard time ‘layering’ clothing, choosing bright colours over grey tones and the phrase ‘ with wild abandon’ doesn’t usually apply to me. But, I do like to mix it up and I definitely like to challenge myself when I can. 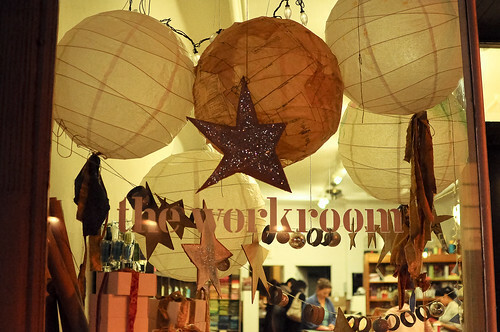 You’ll notice that the holiday windows at the workroom this year are all about that. 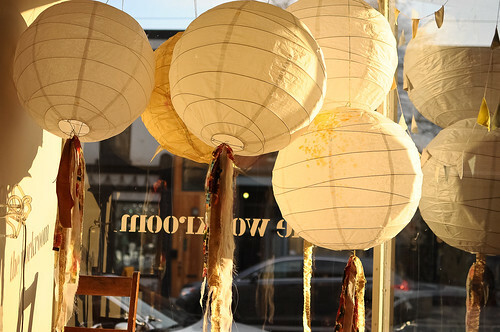 This year’s holiday window was put together by the fabulous Tiffany Pratt of Glitter Pie Studios. Tiffany is all those things that I am not, in the very best way, so I knew she would create a window very different from what you would normally expect at the workroom. 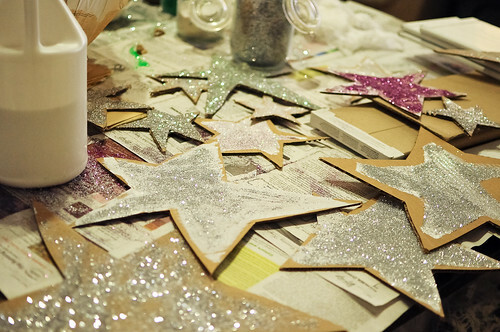 I had one little request for ‘glitter stars’ and I left the rest up to her. 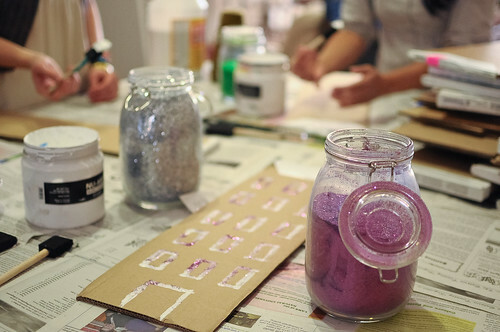 Tiffany arrived at the shop armed with the hugest jars of glitter and mod podge that I’ve ever seen. She gathered cardboard from our recycling pile, scraps of fabric and put us to work. 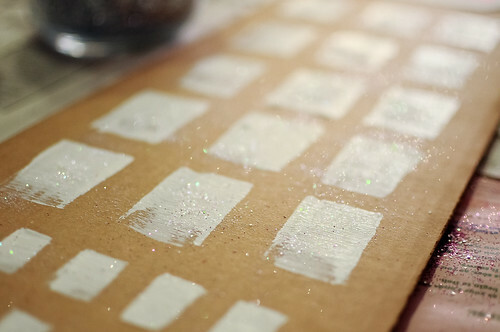 (or rather put us to ‘play’) Painting and covering things in glitter is FUN. This is really what Tiffany does best. 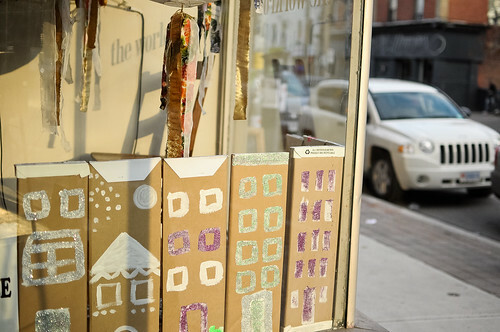 Her Art Studio in a Box (we have these at the workroom!) 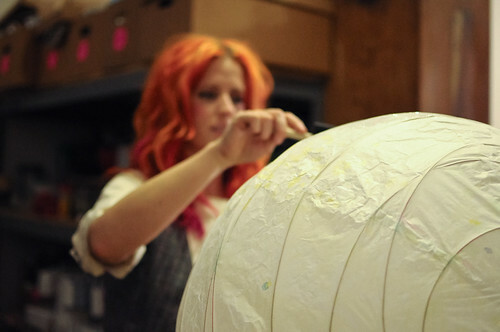 is designed to get the recipient to be creative using all the fun bits and bobs found inside. I love checking out her YouTube videos. You will also find her doing fun DIY segments on the Steven & Chris show. Debbie, Rosalyn & I had lots of laughs putting the window together with Ms. Glitterpie and those glittery stars in the window cheer me up every single day. p.s. Check out Tiffany’s super cute button down vest that she made in our class! hehe! I love it so much karyn! Great job Tiffany! (And I love her hair! her hair is ammaaaazing! and the windows are too! Spectacular! 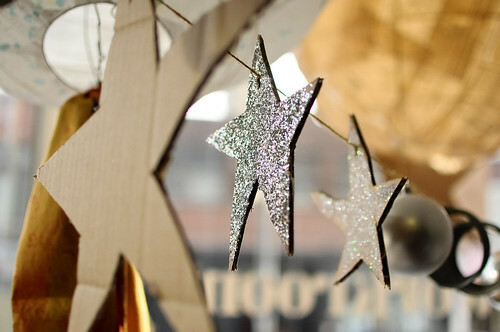 I love the stars and the cardboard city and, in my opinion, there’s just not enough glitter strewn around this world. LOVE the window. And I agree – tiffany has the most amazing energy about her. So nice Karyn that you found a spot for glitter and the unexpected! Love Pom Poms & glitter ! Your Workroom looks amazing! I wish I could participate in all that fun myself. Love the glottery stars! The window looks great! Tori recently posted..Quilt Update: Halfway There! Love the display….have to come by the store soon. 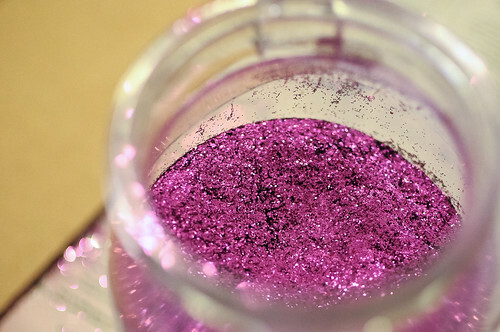 Where can you buy glue by the jug and jarfuls of glitter?